Needham, Massachusetts and Novosibirsk, Russia: April 17, 2015 — LEDAS Ltd., the developer of CAD component software and provider of development services for the engineering software market, today announced that version 3.0 of its LEDAS Geometry Comparison (LGC) software is now available. The new release is dedicated to efficiently processing big sets of 3D CAD data, quickly determining any and all differences in the geometry. 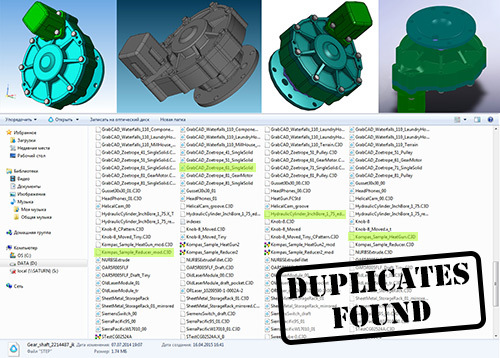 LEDAS Geometry Comparison (LGC) technology makes it possible to compare the geometry of 3D parts and assemblies, comprehensively finding all of the differences between similar looking models, and then reporting the variations to users. The new version of LGC provides users with ability to efficiently find 3D models that share the same geometry and topology, even when models are rotated and moved with respect to one other. LGC’s efficient processing of large sets of models is based on the indexing technology developed in-house by LEDAS. Searching for duplicates is clearly an important exercise in removing excessive copies from parts libraries. LGC is a component available for licensing to CAD, CAM, CAE, PDM, and PLM vendors for integration into their design and data management software. The cost is minimal to end-users, making this software unique on the market. LEDAS Ltd. is a private, employee-owned software company founded in 1999. It is well-known for its development of constraint-based tools and other component technologies for the CAD, CAM, CAE, and PDM markets. LEDAS also provides R&D and consulting services in the field of engineering software. More information about LEDAS is available at www.ledas.com.